Restaurants, Bars for sale and rent in Bulgaria. Bargain property, Restaurant, Bar for sale and to let. BULGARIAN PROPERTIES offer a large number of businesses for sale and rent in Bulgaria, including many listings of bars and restaurants. There are many good reasons to start such a business in our country. 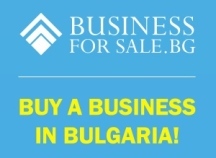 You can also see many more hotels/bars and restaurants for sale on www.BusinessForSale.BG - the leading website for buying and selling businesses and companies in Bulgaria. BusinessForSale.BG was created as a site for companies and individuals with businesses and ideas for sale to connect with investors and entrepreneurs looking to acquire an operating business by merging, purchase or rental. Every tourist coming to Bulgaria wants to eat nice food and try to local and international cuisine offered in the local restaurants. On the other hand the Bulgarian people are known as big bar and restaurant lovers. If you have a good idea you can expect good profits from running a restaurant or a bar in Bulgaria. Some of the other advantages of owning such a business in Bulgaria include the lower prices in bars and restaurants, the liberal tax system in the country and the expected good profits. Many people are making good money out of bars and restaurants in Bulgaria and the value of such business properties is relatively high, although the global crisis led to a decrease in their prices making them a bargain deal.